There are now two system of high fidelity, monophonic (monaural) and stereophonic. Monophonic is a system that starts from one microphone and is fed through a single high fidelity set. Stereophonic is a double system. Two separate microphones are placed at different sides of the orchestra and two different systems are used to keep the two signals or channels separated. Two separate speakersare used, placed on different sides of you room. 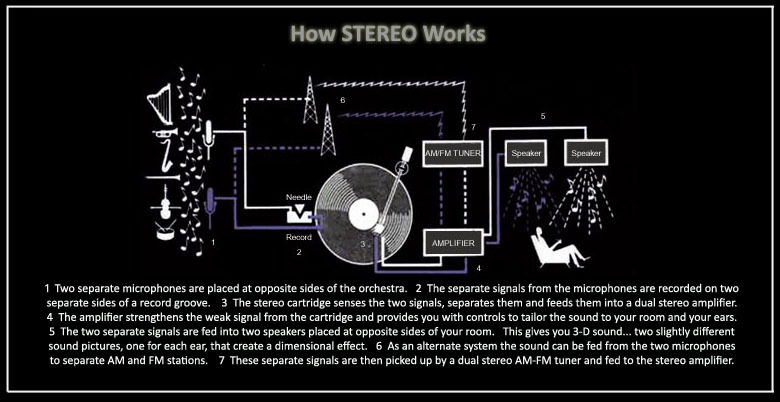 Stereo is much like 3-D photography, two slightly different sound reach your ears giving you a new dimension in sound.